Or more aptly, watching a skein of handspun and/or handdyed yarn dry. Today, at work I took the time to get in my allowed breaks. 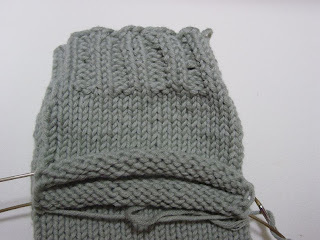 During this time I stayed off the office internet and picked up my knitting needles. 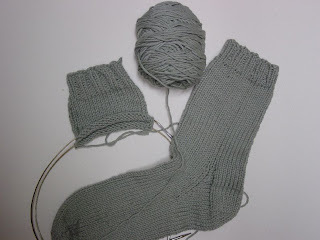 Yes, I am still working on the same second sock that I started last November. Don't worry though, its not second sock syndrome. It's I don't have time to do anything let alone knit a sock syndrome! Well, that's probably not very true. I do have time but can often be found loafing around on the internet doing "something." So, I was working on my sock and thought, for all the progress I felt like I was making, I sure didnt get anywhere. How sad is that. Why do socks seem to go so slowly? At least for me - hats,scarves, and even sweaters seem to go faster.